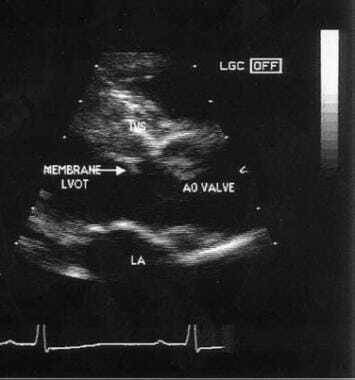 Echocardiogram of membranous subaortic stenosis. AO = aortic; LA = left atrium; LVOT = left ventricular outflow tract. Tunnel-type of subaortic stenosis (subvalvular aortic stenosis [SAS]). MV = mitral valve. The boundaries of the left ventricular outflow tract (LVOT) are formed posterolaterally by the anterior leaflet of the mitral valve and intravalvar fibrosa and anteromedially by the muscular and membranous portions of the interventricular septum. Fixed lesions of the LVOT that cause subvalvar aortic stenosis (SAS) have a spectrum of morphologies. The 4 basic anatomic variants are as follows: (1) a thin discrete membrane consisting of endocardial fold and fibrous tissue, (2) a fibromuscular ridge consisting of a thickened membrane with a muscular base at the crest of the interventricular septum, (3) a diffuse, fibromuscular, tunnel-like narrowing of the LVOT, [3, 4] and (4) accessory or anomalous mitral valve tissue. Types 1 and 2 account for 70-80% of all cases of SAS. Located 0.5-1.5 cm beneath the aortic valve, types 1 and 2 involve a variable extent of the LVOT. Following previous surgical ventricular septal defect patch closure, a steep (>130°) aortoventricular septal angle, increased mitral-aortic separation, and an exaggerated aortic override are present in children who later develop SAS. Abnormalities of the aortic and mitral valves frequently develop during the natural course of subvalvar aortic stenosis (SAS) because of tethering by encroaching fibroelastic tissue of the membrane and fibromuscular ridge. Clinically significant obstruction to ejection due to SAS results in concentric left ventricular (LV) hypertrophy, often with an excessive septal bulge. This effect leads to a cycle of further obstruction and localized fibromuscular growth. SAS has variable and unpredictable rates of progression in children, whereas the rate of progression in adults is slow. Heart failure occurs only occasionally in pediatric patients. When present early in life, heart failure usually results from associated congenital heart defects. Cardiac output usually is well maintained, and systolic function is well preserved in children with isolated SAS, until severe obstruction develops. Thickening of the aortic valve and mild, asymmetrical, poststenotic dilatation of the ascending aorta may be, in part, due to repetitive trauma and vibrations from the high-velocity jet of blood flow through the site of stenosis. Aortic regurgitation, which is usually progressive, develops in nearly 65% of patients in the course of SAS, and it usually persists even after the SAS is removed. The detection of aortic regurgitation is a function of timely follow-up care. Although the aortic regurgitation is usually mild, its incidence and severity increases with an increasing LV outflow tract (LVOT) pressure gradient. This finding may reflect progressive damage to the aortic valve by the high-velocity jet of blood that SAS produces. Aortic regurgitation adds volume overload to an already pressure-overloaded LV. The resultant decreased aortic diastolic pressure leads to diminished coronary perfusion and, in combination with increased left ventricular oxygen demand from pressure and volume overload, predisposes the left ventricular myocardium to ischemic injury. In some patients, progressive aortic regurgitation requires aortic valve repair or replacement at the time of surgical intervention for SAS. 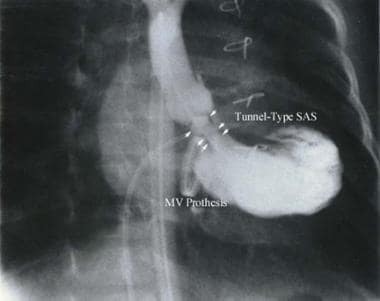 SAS may recur even after surgical resection appears to be complete and is usually a consequence of abnormal left ventricular outflow tract geometry. SAS may have a principally morphogenetic basis, whereby anatomical variants lead to abnormal cell proliferation and morphologic changes due to abnormal flow patterns. [3, 8, 9] Anatomic characteristics that may promote a chronic flow disturbance in the LVOT include a long, narrow LVOT; a steep (>130°) aortoventricular septal angle; increased mitral-aortic separation; and exaggerated aortic override. A focal myocardial abnormality similar to that found in hypertrophic cardiomyopathy may also play a role. The effect of abnormal flow patterns on a genetically vulnerable myocardium may account for the development of SAS in some cases. Such LVOT morphology may inherently increase fluid shear stress on the interventricular septum and induce an abnormal endothelial and muscle-proliferative response in the outflow tract, with eventual formation of a fibromuscular ridge. A possible hemodynamic basis of SAS is that alternation in left-sided flow before and after repair of associated congenital heart defects likely causes turbulence in the LVOT and adds to fluid shear stress on the interventricular septum. Therefore, morphologic abnormalities may result in flow disturbance that may be instrumental in the formation of SAS. The approximate incidence of congenital heart defects is approximately 8 per 1000 live births. Subvalvar aortic stenosis (SAS) accounts for approximately 1% of all congenital heart defects (8 in 10,000 births) and for 15-20% of all fixed left ventricular outflow tract (LVOT) obstructive lesions. The male-to-female ratio of SAS is 2:1 to 3:1. Distinctions in the natural history and postoperative course of SAS between male and female patients have not been clearly defined. However, more male than female patients require repeat surgery. Isolated SAS is rarely seen at birth or during infancy. SAS may develop in some patients after they undergo repair of associated congenital heart defects (eg, ventricular septal defect), usually by age 2 years. Exceptions include patients with Shone complex and interrupted aortic arch, who can have SAS in early infancy. Although natural history studies have not delineated the annual mortality rate, 2-10% of sudden deaths are reported in untreated individuals with severe left ventricular outflow tract (LVOT) obstruction, including subvalvar aortic stenosis (SAS), valvar aortic stenosis, and supravalvar aortic stenosis. Postoperative survival rates are at least 85-95% at 15 years. Late mortality is mostly related to residual LVOT obstruction and repeat operation. Sudden cardiac death, unlike in hypertrophic cardiomyopathy, is reported in only a small percentage of patients with SAS. Sudden cardiac death is usually not the first clinical manifestation of the disease. It almost always occurs in previously symptomatic patients, typically those who have an echo Doppler LVOT pressure gradient of more than 50 mm Hg. Bacterial endocarditis is uncommon and most likely to occur in patients with a damaged aortic valve. Bacterial endocarditis can also result in hemodynamically significant aortic regurgitation and congestive heart failure in patients with SAS. Iwata Y, Imai Y, Shin'oka T, Kurosawa H. Subaortic stenosis associated with systolic anterior motion. Heart Vessels. 2008 Nov. 23(6):436-9. [Medline]. Somerville J, Stone S, Ross D. Fate of patients with fixed subaortic stenosis after surgical removal. Br Heart J. 1980 Jun. 43(6):629-47. [Medline]. [Full Text]. Bezold LI, Smith EO, Kelly K, et al. Development and validation of an echocardiographic model for predicting progression of discrete subaortic stenosis in children. Am J Cardiol. 1998 Feb 1. 81(3):314-20. [Medline]. Edwards JE. Pathology of left ventricular outflow tract obstruction. Circulation. 1965 Apr. 31:586-99. [Medline]. Pavione MA, Mendonça JT, Souza IS, Russo MA. Accessory mitral leaflet: an uncommon form of subaortic stenosis. Rev Bras Cir Cardiovasc. 2012 Jul-Sep. 27(3):477-80. [Medline]. Ezon DS. Fixed subaortic stenosis: a clinical dilemma for clinicians and patients. Congenit Heart Dis. 2013 Sep. 8(5):450-6. [Medline]. Gokalp S, Oztunc F. Clinically asymptomatic myocardial bridging in a child with familial subaortic stenosis. Cardiol Young. 2013 Jun 28. 1-3. [Medline]. Barkhordarian R, Wen-Hong D, Li W, et al. Geometry of the left ventricular outflow tract in fixed subaortic stenosis and intact ventricular septum: an echocardiographic study in children and adults. J Thorac Cardiovasc Surg. 2007 Jan. 133(1):196-203. [Medline]. Kleinert S, Geva T. Echocardiographic morphometry and geometry of the left ventricular outflow tract in fixed subaortic stenosis. J Am Coll Cardiol. 1993 Nov 1. 22(5):1501-8. [Medline]. Reist-Marti SB, Dolf G, Leeb T, et al. Genetic evidence of subaortic stenosis in the Newfoundland dog. Vet Rec. 2012 Jun 9. 170 (23):597. [Medline]. Newfeld EA, Muster AJ, Paul MH, et al. Discrete subvalvular aortic stenosis in childhood. Study of 51 patients. Am J Cardiol. 1976 Jul. 38(1):53-61. [Medline]. Wright GB, Keane JF, Nadas AS, et al. Fixed subaortic stenosis in the young: medical and surgical course in 83 patients. Am J Cardiol. 1983 Oct 1. 52(7):830-5. [Medline]. Suri RM, Dearani JA, Schaff HV, Danielson GK, Puga FJ. Long-term results of the Konno procedure for complex left ventricular outflow tract obstruction. J Thorac Cardiovasc Surg. 2006 Nov. 132(5):1064-71. [Medline]. Karamlou T, Gurofsky R, Bojcevski A, et al. Prevalence and associated risk factors for intervention in 313 children with subaortic stenosis. Ann Thorac Surg. 2007 Sep. 84(3):900-6; discussion 906. [Medline]. Rohlicek CV, del Pino SF, Hosking M, Miro J, Côté JM, Finley J. Natural history and surgical outcomes for isolated discrete subaortic stenosis in children. Heart. 1999 Dec. 82(6):708-13. [Medline]. [Full Text]. Gersony WM. Natural history of discrete subvalvar aortic stenosis: management implications. J Am Coll Cardiol. 2001 Sep. 38(3):843-5. [Medline]. Brauner R, Laks H, Drinkwater DC Jr, Shvarts O, Eghbali K, Galindo A. Benefits of early surgical repair in fixed subaortic stenosis. J Am Coll Cardiol. 1997 Dec. 30(7):1835-42. [Medline]. de Agustin JA, Gomez de Diego JJ, Marcos-Alberca P, Macaya C, Perez de Isla L. Combined subaortic membrane and aortic valve stenosis: additive value of three-dimensional echocardiography. Eur Heart J Cardiovasc Imaging. 2013 Oct 18. [Medline]. Singh GK, Shiota T, Cobanoglu A, et al. Diagnostic accuracy and role of intraoperative biplane transesophageal echocardiography in pediatric patients with left ventricle outflow tract lesions. J Am Soc Echocardiogr. 1998 Jan. 11(1):47-56. [Medline]. Guglin M, Kristof-Kuteyeva O. Congenital discrete subaortic stenosis in pregnancy: case report and literature review. J Heart Valve Dis. 2013 May. 22(3):439-44. [Medline].